Revision hip surgery is major and complex surgery and requires considerable amount of skill and experience. Mr Samsani has undergone this specialist training in revision hip surgery at world renowned Joint Replacement centres like Guy’s Hospital under supervision of Dr David Nunn and Dr Marcus Banks, and also at Austin Health Medical Centre under supervision of Dr Neil Bergman-world renowned revision hip and knee surgeon in Melbourne Australia. Mr Samsani has performed hundreds of complex revision hip replacement surgeries at Medway NHS Hospital as Senior Consultant Hip and Knee Surgeon. NEXT: WHAT IS A TOTAL HIP REPLACEMENT? JUMP TO: WHY DO HIP REPLACEMENTS FAIL? What is a Revision Hip Replacement? Total hip replacement is one of the most successful operations of orthopaedic surgery and is very effective in relieving pain and disability of hip arthritis. Despite improvements in surgical techniques and advances in implant manufacturing technologies, total hip replacement may not last forever and can fail during an individual’s life time. There are several reasons for failure of a hip replacement. When a hip replacement fails and causes symptoms, another operation may be required to remove the failed hip joint and replace with new hip prosthesis. This surgery is called revision hip replacement. Why does a hip replacement fail? •	Excessive wear and osteolysis: The articulation (bearing surfaces) of a hip replacement may wear out over a period of time. The debris released from articulation due to the excessive wear may induce inflammatory response which can dissolve the bone around the prosthesis. This can cause pain, loosening of prosthesis, fracture of the bone and dislocation of the hip replacement. •	Aseptic loosening: The hip replacement prosthesis becomes loose within the bone causing pain and difficulty in weight bearing. This may be associated with excessive wear of the articulation and osteolysis of the bone around the prosthesis. Usually this the commonest cause of revision surgery. •	Dislocation: Dislocation is a condition where head of the hip replacement comes out of the socket. When the dislocation occurs easily and at frequent intervals, it usually requires revision surgery to prevent the dislocation happening again. Acute dislocation is a painful condition and need immediate reduction of the joint. •	Infection: Infection is a rare complication of hip replacement. It is usually treated with antibiotics initially and sometimes this is combined with cleaning of the wound under general anaesthesia. However, when the infection becomes chronic and settles deeply around the hip replacement prosthesis it usually requires revision surgery to cure the infection. Infection causes redness, swelling, continuous pain, stiffness of hip and may associated with sinuses discharging pus. Revision surgery for infection is usually undertaken in two stages. First stage involves removal of infected prosthesis, cleaning of wound, insertion of an antibiotic loaded cement spacer and administration of antibiotics. When the infection has resolved from the hip wound, a second stage operation is undertaken. Second stage operation involves removal of the cement spacer and insertion of new hip replacement prosthesis. This two-stage procedure can take 6 to 9 months to complete. •	Fractures: Sometimes an accidental fall or injury can result in fracture around a hip prosthesis. The fracture can result in loosening of the hip replacement prosthesis. When the prosthesis becomes loose it requires a revision surgery. •	Malalignment: When the hip replacement is not positioned properly, it can cause pain, may wear out quickly, result in recurrent dislocations or even cause early loosening of prosthesis. •	The revision surgery may be necessary if any of the above mentioned clinical scenarios arise. 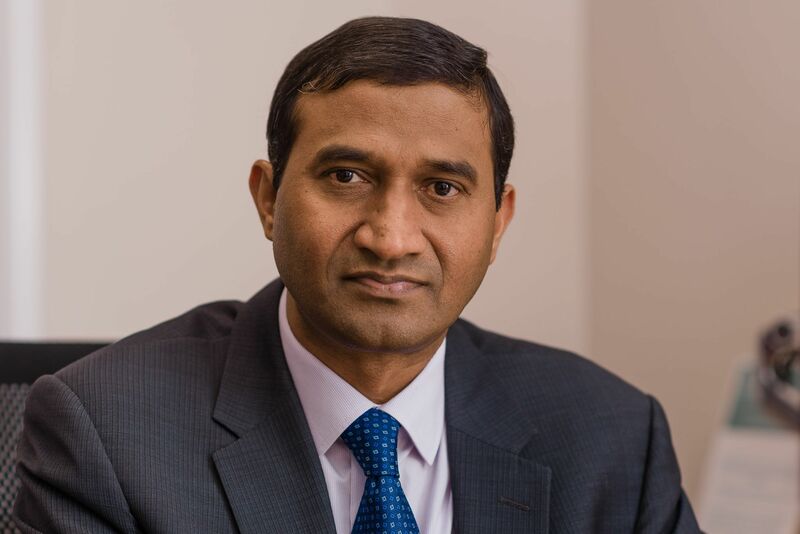 Once the cause of the failure of hip replacement is established, Mr Samsani will discuss various treatment options available to you including the option of revision surgery. He will also explain to you about the possible risks of revision hip replacement surgery, including intra-operative and postoperative complications. You must also understand that the revision hip replacement is a major operation and risk of complications is higher compared to that of first time hip replacement. It also takes longer to recover after the operation and sometimes it can take up to a year for optimum recovery after surgery. It is the patient who should make the final decision about the revision surgery having considered all the benefits and risks of revision hip surgery and discussed with his or her family members. What happens before the revision hip replacement operation? Orthopaedic examination: You will be evaluated by Mr Samsani to confirm the diagnosis. He will ask you questions about your hip symptoms, disability and your medical health. He will obtain x-rays of the failed hip. In addition, special scans such as CT scan and bone scan may also need to be performed to establish the cause of failure of hip replacement. Preoperative assessment and preparation for surgery: The main aim of the preoperative assessment procedure is to make sure that you are fit for revision surgery and recover well after operation. As a part of this you may have a general medical examination and undergo a few tests. Medical examination: You may be reviewed by a medical specialist to make sure your general health is in satisfactory condition to undergo revision surgery and complete recovery after the operation. You may also be seen by a specialist medical doctor such as Cardiologist or Nephrologist if you have chronic medical problems such as angina, kidney problems. •	Tests: Routine blood and urine tests and an ECG may be carried out. A chest x-ray may be needed. •	Medication: Inform Mr Samsani or his team about all the medicines you are taking. Please carry a list of your medicines with you including the name, dosage, and how often you take it. Mr Samsani or his team will advise you which medicine you should stop or can continue taking before surgery. •	Preparing your skin: Presence of a focus of infection in the body at the time of operation increases the risk of wound infection. Make sure that you do not have any infection either on the leg or anywhere else on your body before surgery. Contact Mr Samsani or his team if you notice any infection to get it treated before operation. •	Dental evaluation: If you suffer from any dental problems or diseases, you should get it treated before the revision operation. Dental procedures (dental extractions, periodontal work) release bacteria in to blood steam which increases the risk of wound infection. Routine cleaning of teeth should be delayed for few weeks after revision surgery. •	Urinary problems: People with history of urinary infections may require urological assessment to rule out any on-going urinary infection before surgery. Severe prostate conditions may have to be treated before revision surgery. •	Blood donations: Major blood loss can occur during revision hip replacement surgery and you may need blood transfusion during or after the operation. Therefore, Mr Samsani or his team may ask you to donate your own blood before the operation. This will be stored in the blood bank in case you need it after surgery. •	Help from family and friends: After revision hip replacement surgery you will be walking with the help of crutches or a frame. However, you will benefit from some help for several months with day to day activities such as cooking, bathing, shopping and laundry. •	Home planning: Some home modifications are required to make your home return easier during your recovery from hip replacement surgery. Following are the list of home modifications that can make your home easier to navigate after surgery. o	Secure handrails along stairways. o	A firm pillow for your chairs, sofas, and car that enable you sit with your knees at a lower level than hips. Most of the people are admitted on the day or one day before the operation. In this type of anaesthesia, you are put to sleep completely during the operation and a machine controls your breathing. Sometimes nerve blocks (injection around the nerves to numb them) are given for postoperative pain relief and are used along with general anaesthesia. Spinal (epidural) anaesthesia: An injection is given to your back to numb your hips and legs. You will be awake during the operation and usually a sedative is administered to put you into a light sleep. This is generally a preferred anaesthetic technique for total hip replacement operation. Sometimes a combination of spinal and general anaesthesia is administered as the operation takes a longer time to perform. The Anaesthetist will also discuss with you about the possibility of postoperative recovery in a high dependency or Intensive care unit for few days immediately after surgery for intense monitoring. The revision hip replacement operation can take between 2 to 4 hours to complete. Revision hip surgery is a more complex and technically more demanding procedure than the primary hip replacement procedure. This is because of the excessive scarring of soft tissues from previous surgery, and the reduced amount of quality and or quantity of bone available to place the revision prosthesis in to. During the operation the surgeon removes the failed hip carefully without much damage to the soft tissues and the host bone. A part or whole of the failed hip replacement prosthesis may be removed. This sometimes involves making a small opening in the thigh bone to remove the pin (femoral stem) from the upper part of thigh bone. When the revision surgery is carried out for infection it is performed in two stages. First stage involves removal of infected prosthesis, cleaning of wound and insertion of an antibiotic spacer. Once the infection is cleared, then the second stage is carried out in which a new revision hip prosthesis is inserted. Sometimes extra bone may be required during the surgery to fill the bone defects in the hip and this is usually obtained from a bone bank (allograft). The risk of disease transmission with the bank bone is very rare. Sometimes the bone deficiencies in the pelvis may be filled with special metal augments before inserting the revision hip prosthesis. Treatment solutions have to be tailor made as failure mechanism of hip replacement varies from patient to patient. The scar of the revision hip surgery operation may be longer than the first-time hip replacement. Revision hip replacement is a major operation and some amount of pain is felt in the hip after the operation. Pain killers are given either through a vein or by mouth to make you as comfortable as possible. Pain killers should be taken at regular intervals to prevent any breakthrough pain. Adequate postoperative pain relief is also essential to start early mobilisation and physiotherapy after the operation. During your hospital stay a physiotherapist will visit you regularly to help you with early mobilisation and commence your exercises. It is important to mobilise as soon as possible after surgery to minimise the risk of complications such as blood clots, chest infection, bedsores etc. Standing and walking usually begins on the day of or the day after the operation. Physiotherapist will help you walk with a walking frame initially. Once you are walking confidently with the frame, you will then progress to crutches and later onto a walking stick. Physiotherapist will also teach you the exercises to help strengthen the muscles around hip and the leg. Due to the effects of anaesthesia, pain medication and lying in the bed, patients tend to have shallow breathing in the early postoperative periods. This shallow breathing can lead to lung collapse and chest infection. Breathing exercises (deep and frequent breaths and frequent coughing) will help you reduce the risk of lung collapse and lung infection. A special breathing apparatus (spirometer) may be used to encourage deep breathing. Depending on complexity of surgery and surgeon’s preference you will either fully or partially weight bear after operation. You will also be shown positions of the leg you should avoid to prevent the risk of dislocation. Occupational therapist will also visit you to assess your home environment and furniture is suitable. •	Do not bend the operated hip more than 90 degrees. Do not reach forward when sitting and to reach any thing! Use aides of daily living to accomplish these tasks. •	Avoid lying or sleeping on the operated leg. You may be able to sleep or lie on the non-operated side with pillow between legs. Revision hip replacement is complex and technically demanding operation. It requires general or regional (spinal or epidural) anaesthesia or both and a small risk of complication is associated with administration of these anaesthetic techniques. Sometimes nerve blocks are administered to achieve pain relief after operation. Before undertaking the surgery, the surgeon will explain to the patient in detail about the risks of the surgery and on approximate rehabilitation time. •	Major bleeding: Revision hip surgery is major surgery and is associated with small risk of major bleeding. This risk is generally managed well with optimal preoperative assessment and preparation of the patient and use of intra-operative call saver for blood salvage and reuse. •	Infection: Infection remains one of the serious complications of revision hip replacement surgery. The risk of infection is reduced by administration of antibiotics in the perioperative period. Superficial infections are usually treated with antibiotics and deep infections may require washout of wound in addition to antibiotics. Rarely the deep infection may not respond to the antibiotics alone and may require implant removal and reinsertion of implant after some time as a two stage procedure. •	Deep Venous Thrombosis and Pulmonary Embolism: Blood clots can occur after any type of hip surgery. As the revision surgery takes longer time to perform and the patients are slow to mobilise after surgery, the risk of blood clot formation is slightly higher. This risk is reduced by administration of blood thinning injections or tablets after surgery. Others such as TED stockings and calf compression devises are also used to reduce the risk of blood clots. Early mobilisation after surgery also reduces this risk. Rarely, if not detected and treated properly a portion of the blood clot can break off and migrate to lungs causing pulmonary embolism ( about 0.5%), a serious and life threatening condition. •	Leg length inequality: It is not uncommon to see leg length discrepancy following revision hip replacement. In most of the cases it is easily tolerated. Other cases may require shoe rise on the shorter side to correct leg length inequality. One of the reasons for discrepancy may be the result of adjusting an adequate tension in the artificial hip joint to prevent dislocation. Initially the leg may sometimes appear to be long but this is often due to muscle contractures which over time will loosen up and leg lengths will even out. •	Hip Dislocation: Artificial joints may dislocate occasionally. The risk of dislocation is higher after revision surgery than after first time hip replacement and is generally around 1 to 5%. Provided the components are placed in satisfactory position and the appropriate hip precautions are followed in the postoperative period, it is unlikely that the hip joint will dislocate. •	Fracture of Femur and Pelvis bone: Fracture of thigh bone and hip bone can occur during the surgery but is very rare. The fractures that occur during surgery are usually treated immediately with wiring or plating. It is also very rare to see these fractures after the surgery unless the patient has been involved in a bad accident. •	Loosening of prosthesis: Artificial hip joint may not last forever and they can wear out or become loose during an individual’s life time. Loosening will happen when the prosthesis is not fixed to bone due to lack of bone ingrowth in the prosthesis or if the bearing surface wear out to produce areas of bone loss around the prosthesis, leading to loosening. If the prosthesis becomes loose it needs to be revised. Alternatively if only the bearing surface wears out and the prosthesis remains stable, then usually only bearing surface requires revision which is a smaller operation. •	Damage to nerves and vessels: Damage to major nerves (sciatic and femoral nerves) around the hip joint is very rare. Sometimes these nerves get stretched during the operation and may result in temporary paralysis of the affected nerves. Permanent damage to the nerves can occur but is very rare. Damage to major vessels (femoral and profounda) is again very rare. If this happens an immediate vascular repair may be required. •	Haematoma: Occasionally persistent bleeding following surgery in the tissues around hip joint can result in formation of haematoma. This may sometimes require surgical drainage. •	Scarring: Scar after revision hip replacement is often longer than that of first time hip replacement. Some patients tend to have more scarring than others and in other patients the scar becomes much thicker leading to keloid formation. Generally no further surgery is required. •	Swelling of legs: Some amount of swelling of legs is common after hip surgery. It is resolved gradually over a period of time and can take up to 3 to 6 months. Elevation, stockings and active exercises of the leg following the surgery will help reduce the swelling. •	Trochanteric bursitis: Occasionally patients experience pain over the outer side of the hip joint due to inflammation of tissues at the side of the hip joint. In the majority of cases this will settles down with non-operative treatment in the form of pain killers, exercises and local steroid injections. •	New bone formation: Very rarely new bone (heterotopic ossification) is formed around the hip joint which can cause some stiffness. Significant stiffness of hip joint is very rare as a result of this. •	Heart attack, Stroke, or Chest infection: Major surgery like revision hip replacement can put a strain on vital organs such as heart, lungs etc. A small number of patients may develop serious conditions in the perioperative period such as heart attack, chest infection, stroke etc. The risk of having these problems is higher in patients who already have pre-existing heart and lung conditions. Careful preoperative assessment will help to minimise these risks. •	Urinary problems: Some types of anaesthesia can cause temporary difficulty in urinating after surgery. This is usually treated by inserting a sterile catheter into the bladder temporarily to drain urine. Urinary tract infection also can occur after surgery and is usually treated effectively with antibiotics. •	Constipation: Constipation is common after surgery mostly due to pain relieving medications and lack of mobility. It is effectively treated by taking plenty of water, eating high fibre content food, early mobilisation and, sometimes, taking laxatives. Successful outcome following revision hip replacement depends mainly on how well you follow various instructions given by the surgeon in the first 6 to 12 weeks after revision hip replacement. Food and Eating: No special diet is required after revision hip replacement surgery. Patients will be encouraged to have a balanced diet and drink plenty of non-alcoholic fluids. You may sometimes be advised to take iron supplements for a limited period. •	Improving the ability to walk gradually, initially inside your home and later outside. •	Resuming activities such as sitting and standing as well as stair climbing. •	Strengthening leg exercises and improving hip movements. •	Avoiding certain positions of leg to avoid dislocation of artificial hip joint. Dislocation is a recognised complication of revision hip replacement and its incidence is slightly higher after revision hip replacement than the first-time hip replacement. It tends to happen commonly in the first 12 weeks after surgery. Special precautions should be taken, as mentioned below, to reduce the risk of dislocation. Prevention of infection: Infection after revision total hip replacement is rare. However, presence of an active focus of infection in the body can result in spread the bacteria through the blood steam. These bacteria then can lodge at the revision hip replacement site and result in infection. Common causes of such infection are urinary tract infections and skin and nail bed infections and must be treated with antibiotics immediately. You must also take prophylactic antibiotics too before any dental procedure to prevent spread of bacteria through the blood stream. •	Prevention of Blood clot: Blood clots can occur in the legs after revision hip replacement surgery. Early mobilisation and continuation of exercises after operation combined with administration of blood thinning medicines reduces the risk of blood clots in legs. Preventing falls: For 4 to 6 weeks after the operation, due to pain, stiffness and lack of strength in leg muscles, your gait may be slightly unsteady and falls may occur. Stairs and uneven surfaces are particularly hazardous. Falls immediately after operation can cause serious damage to your new revision hip and may result in need for further surgery. Therefore, you should use a walking stick, crutches, frame or have someone to help you until your balance, flexibility and strength is improved.